When Indira Weech returned home to the Bahamas after living in Europe, she started a movement. Determined to offer tourists an authentic Bahamian experience, Indira decided to forego traditional souvenirs, opting for soap, which she dubbed the “useful souvenir”. 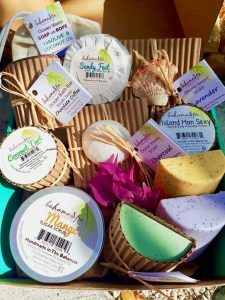 Her handcrafted, skin-loving bars, formulated with indigenous botanicals and Caribbean scents, provide the perfect way for visitors to the Bahamas to take home a little piece of paradise. And her focus on using natural ingredients and sustainable packaging has been at the forefront of her eco-conscious living in the Bahamas, inspiring others to be more mindful of how much they throw away. From just soaps in 2004, bahamaSpa™ has expanded to a full body and hair care range, including body scrubs, butters, creams, lotions, massage oils and shampoo bars. And at the root of the company’s success, is Indira’s passion. As she tells it, she’s obsessed with formulating products that are good for both the user and the environment. Looking back on her own failures, Weech shared that there have been many, including the closing of her business and starting again from scratch. But she believes when entrepreneurs share their story, they should willingly share both the highs and the lows, so that those contemplating the journey have a true sense of what it can be like. It’s been 11 years since Indira started building the bahamaSpa™ brand, and many of them have been spent learning about product formulation and about the beneficial properties of plants and herbs. The focus on, and investment in continuous education has been worth it. Her palm, phthalate and paraben free products are receiving rave reviews, and have found their way into luxury spas across the Bahamas. The demand for this healthier, environmentally friendly skin care option has been so high, that keeping up supply has been challenging. And, because many of the tourists who try Weech’s “souvenirs” want more than a one-off experience, her focus is now on getting export ready. Inspired by the sights, sounds and smells of Paris while exploring the city as a child, Weech knew then she wanted to be a creator. She wanted to produce something beautiful and artistic that brought pleasure to its users, and she wanted it to be on display in one of the luxurious Parisian storefronts she peered into and fell in love with. bahamaSpa™, with support from the WE-Xport programme, is at the beginning of the realization of that dream, and Indira is confident, that she will one day walk the streets of Paris, and see her products looking back at her from the other side of the glass. Visit the We-Xport booth at Bmex in June 2019 to see the bahamaSpa™ range of products.